Budgeting Bloggers is a linkup hosted by Fran of Franish where you recap what you purchased and spent in the past month in an effort to curate a functional closet! September has (quickly) come to an end. I’m linking up late, but better than never, for budgeting bloggers. Here’s what I brought home for the month of September, all planning for my fall capsule. Gap really hit it out of the park this year with their offerings for fall. I was in there one Wednesday morning at my closest Gap (which is now 40 miles away) and had the store all to myself. The skirt is supposed to be online only, but I was thrilled to find it in store and to find how well it fit. I have been searching for a navy maxi skirt and this one ticked all the boxes: knee length, some stretch, slimming. It also made me happy that the gingham button up I returned in March fit this month! It was great motivation to keep trying, even though the number on the scale hasn’t changed. As you can see, my love affair with madewell continues. SO IN LOVE! The jeweled sweatshirt is a little on the cropped side, but I love the weight and fit on it so much more than the similar J.Crew one that I stalked forever. I’m loving the capsule wardrobe concept. My picks are so much more specific at the store now because I’m thinking about exactly what I need for it. Unfortunately, I’m still on a boots quest. Four pairs have been bought and returned so far. So how did you do this month? Link up with Fran and share! Whether you enjoy it or not, packing is most likely the most stressful part of going on vacation. You’re about packing too much, too little. Then there’s the inevitable ” I forgot…” moment. This trip I remembered almost everything. Forgot my eyeliner, but thankfully, had my Birchbox+Benefit party box (more on that next week) which had their new “They’re Real” liner in it. Though there’s always the option to buy items when you reach your destination, you always hate to spend vacation money on things you have at home. 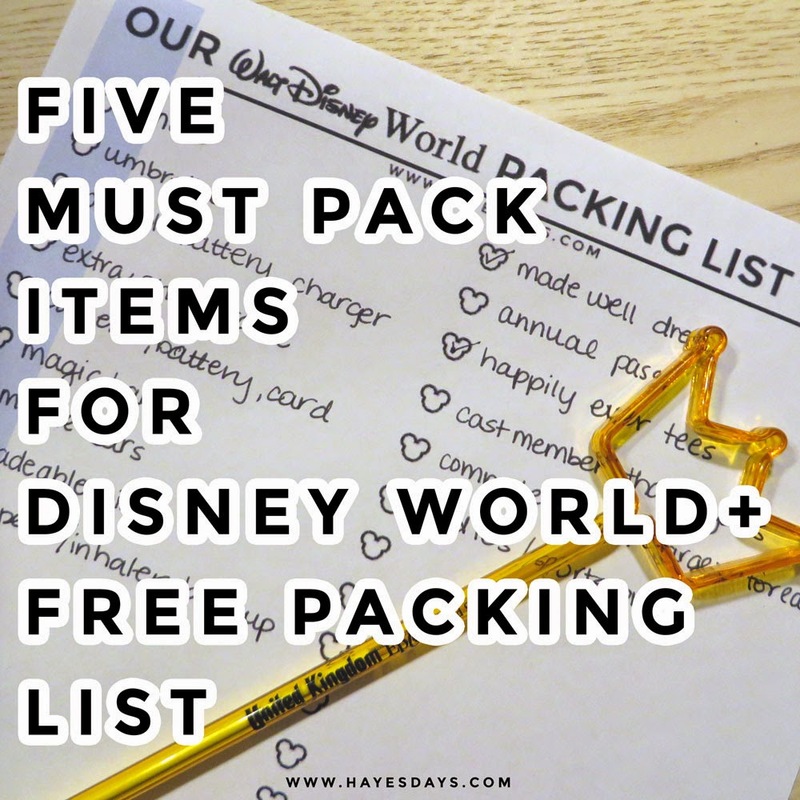 Here are the five things I always pack first to make sure I have and I gave it a shot and created a free printable blank packing list for packing planning! 1. Camera + Extra Memory Card and Battery:: Even though phones have great cameras on them, there are still some moments that you want to look the absolute best and a nice DSLR or interchangeable lens camera. Make sure you have an extra memory card and battery too since you’ll be away from an outlet all day. 2. Umbrella + Poncho:: Either/or but make sure you pack at least one! It rains almost every day in Orlando. 3. Blister care items:: As much as I would love to think there are shoes out there that won’t make blisters, I don’t think they really exist. So make sure you have blister bandaids and my personal favorite, moleskin. 4. Cast Member thank yous:: I’ll be posting about these at capturingmagic.me soon, but just something small, usually handmade– and you wouldn’t believe how excited cast members get to receive these sweet sentiments. It’s a great way to show them you appreciate the extra magic. 5. Portable phone charger:: I take two with me because I’m always on my phone at Disney and running several apps at once, checking wait times, taking pictures, posting pictures. If you have a portable phone charger, you can charge and travel at the same time and not be tethered to a wall or spend time trying to find an outlet. So those are the five items I never leave behind, pretty much for any vacation I’m on. 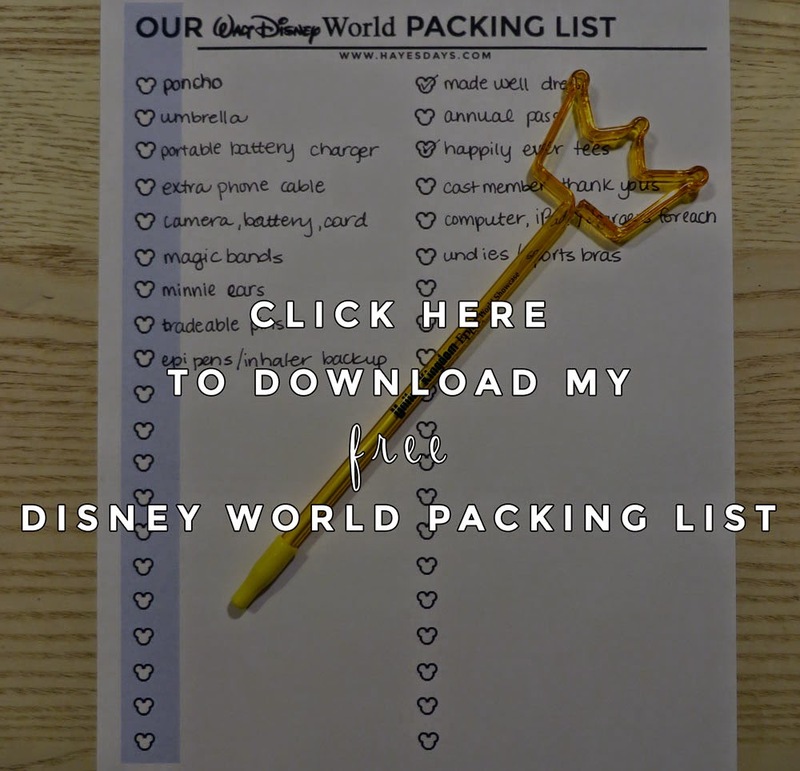 There are tons of great detailed packing lists out there for Disney vacations, but I understand that every family is different, so I created a free blank list to help you plan what you need to pack! 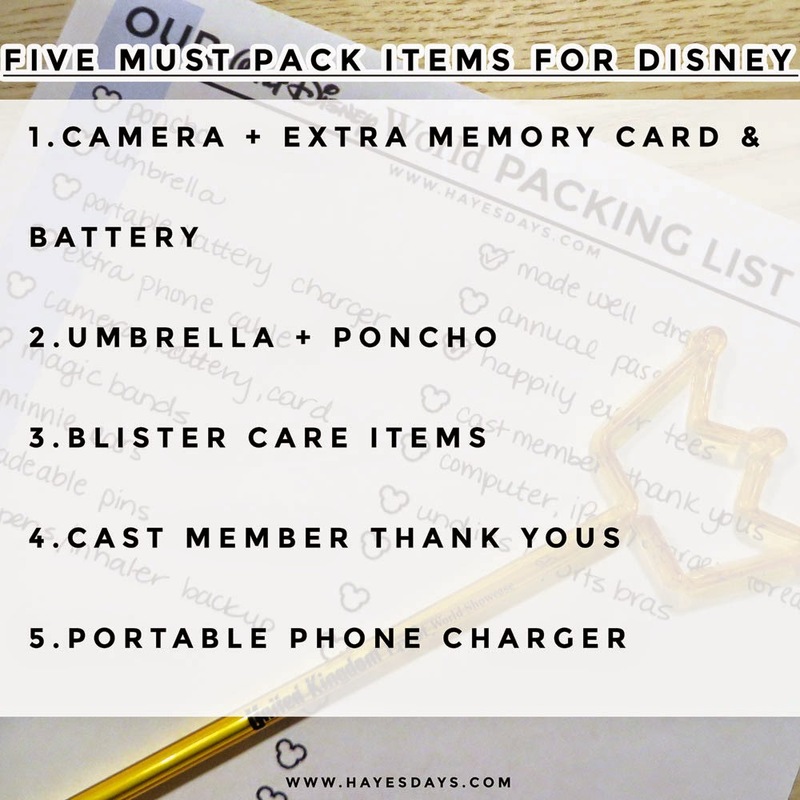 Check off each “Mickey” as you pack the item. What do you never leave home without when you’re headed on vacation? I told you you were going to get tired of seeing Disney. Trust me, I’ll be back to home and back to shopping, outfits, working on the house and doing other stuff. I don’t get to share my love for Disney that often and what more appropriate time than when I’m on vacation in the place where dreams come true? One of my favorite things about Disney Parks is the music. It’s very unique and adds to the appeal to the senses. 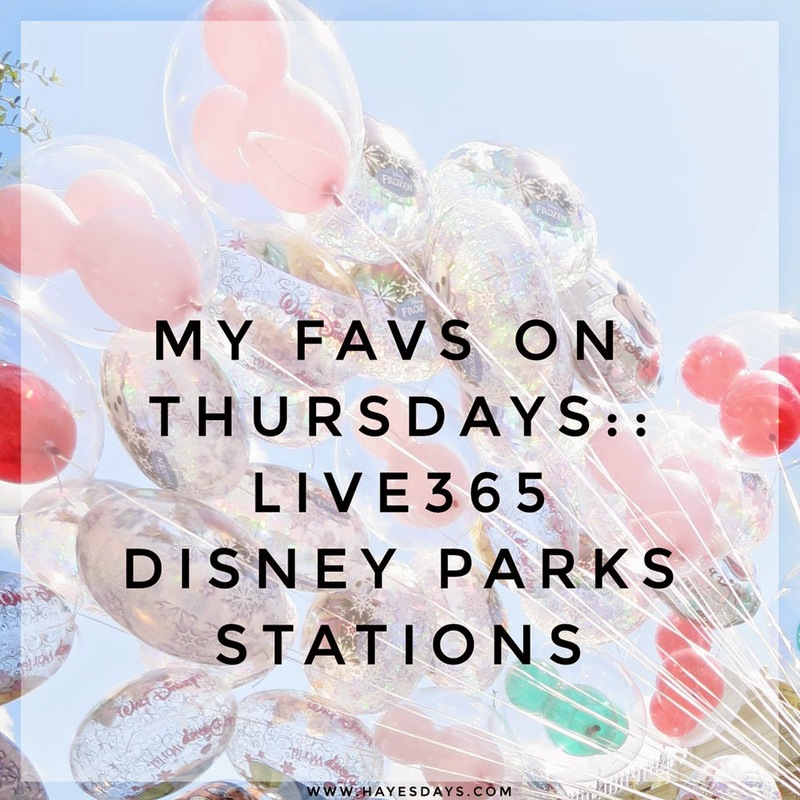 Between trips, I love to listen to Disney Parks music on Live365. 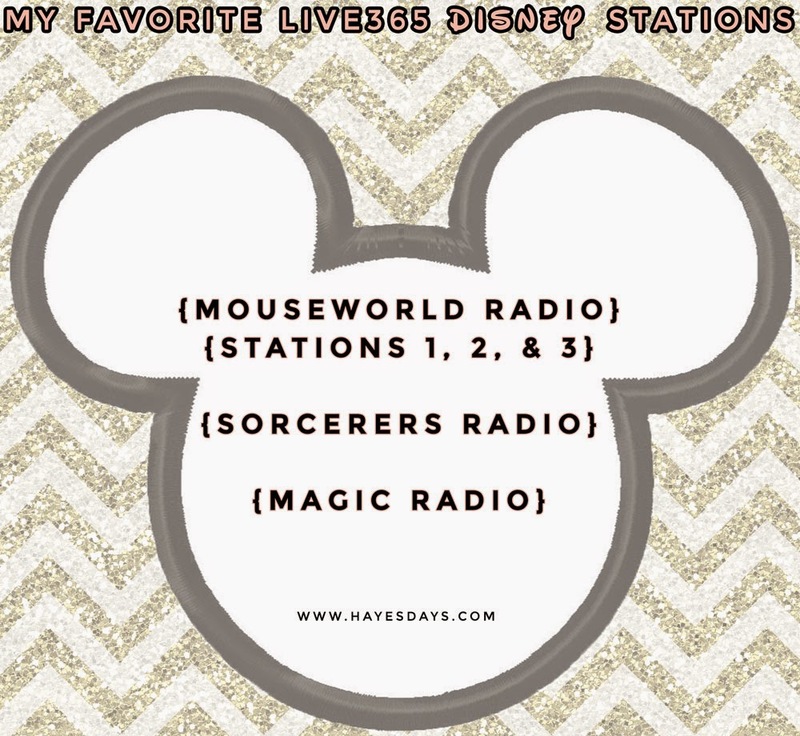 To get to the Disney stations, click on the “genres”>> select “soundtracks >> select the station of your choice! You can listen for free too, which is a great bonus. Take a listen and bring back some childhood memories. Make sure you link up and share your favorites from this week with me, Katy, and Nicole. 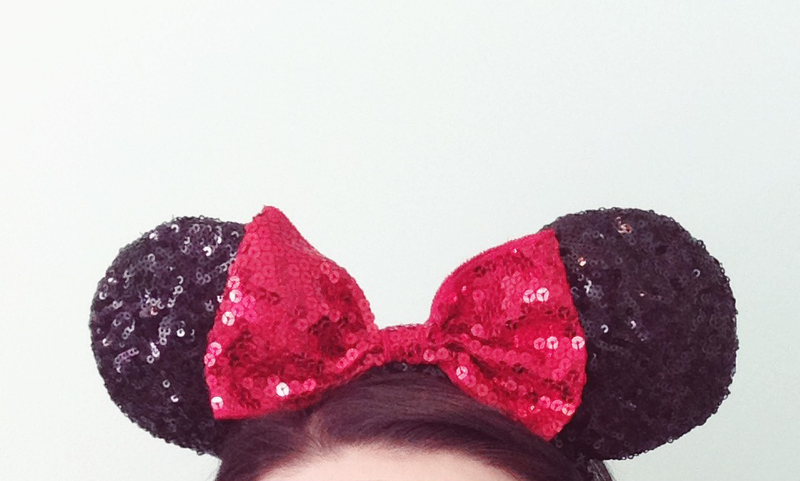 One of the biggest problems about packing for a Disney vacation is how difficult is is to dress for the parks. It’s hot, it rains, you walk a lot. For the majority of visitors, these are not conditions they deal with on a daily basis. Here’s what I find comfortable for theme park touring and why. Headgear:: Whether its ears, an ear hat, or a plain ol hat, head gear is handy to have to keep hair out of your face. I also pack a baseball hat for the sunny days to keep the sun out of my eyes and off my face. 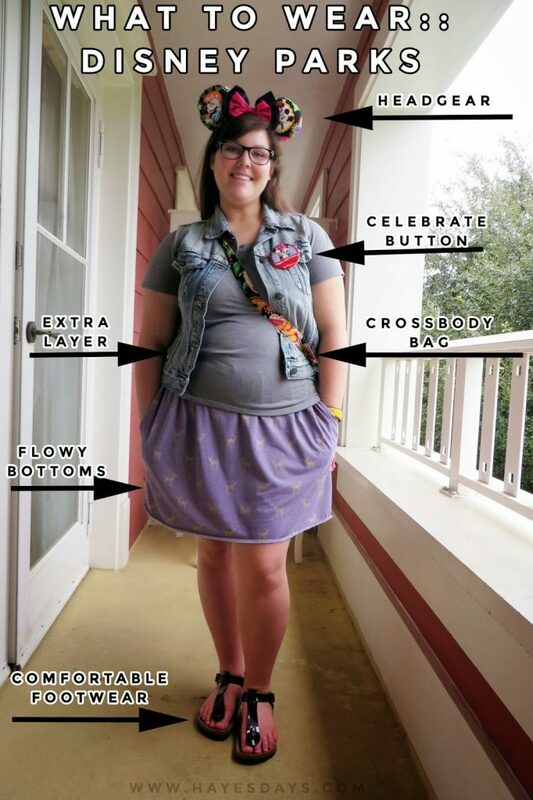 Celebration button:: Disney vacation are all about celebrations. Wear the button to let others know! All the cast members want to make sure you’re having the greatest celebration possible. Crossbody Bag:: I see seasoned vets carrying all kinds of bags, but I recommend a crossbody because you can access the bag with two hands while still walking instead of having to stop or pause to use one hand to hold while you dig in your tote for something. Extra Layer:: After May, when I wore a vest the entire time, I decided that was the way to go. I loved having all the extra pockets without sleeves and a thick layer making me super hot. I highly recommend bringing one also as a rain protectant. Flowy Bottoms:: I endorse wearing skirts in the parks– with compression shorts underneath. I’m not comfortable wearing leggings or compression capris without a covering them up so cute cotton skirts work for me. I also pack chino shorts for a switch up, but I love my skirts and compression shorts underneath. Comfortable footwear:: There’s no one pair of shoes that I think works across the board for everyone. Though I love my Toms, I’ve also tried some other great shoes. I’m doing a write up on my Reef Bella Costas and my Birken Karios when I get home. Take the shoes you find most comfortable at home. Please don’t ever try new shoes at Disney! Hi guys! 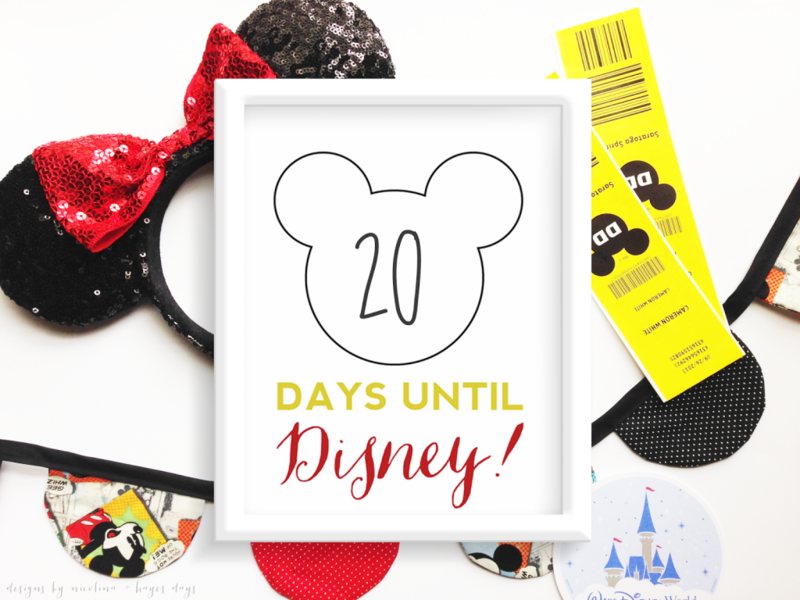 While I’m on vacation I’ll be sharing a few posts this week, but my blogging and Disney buddy Nicole is here today sharing a totally cute way to countdown to your vacation. Hey there! I’m Nicole, blogger at designsbynicolina.blogspot.com and one of Meghan’s best Disney girls. While Meghan and Corey are off having fun at the parks and celebrating their 5th anniversary I am guest posting here and sharing an awesome FREE printable! The worst part about planning a trip to Disney is the WAITING. So to help you out, I am excited to share a FREE printable countdown to help you make it through! On top of always making a cute countdown, we usually like to watch Disney classics (and some new ones) and I love Disney DIYs. 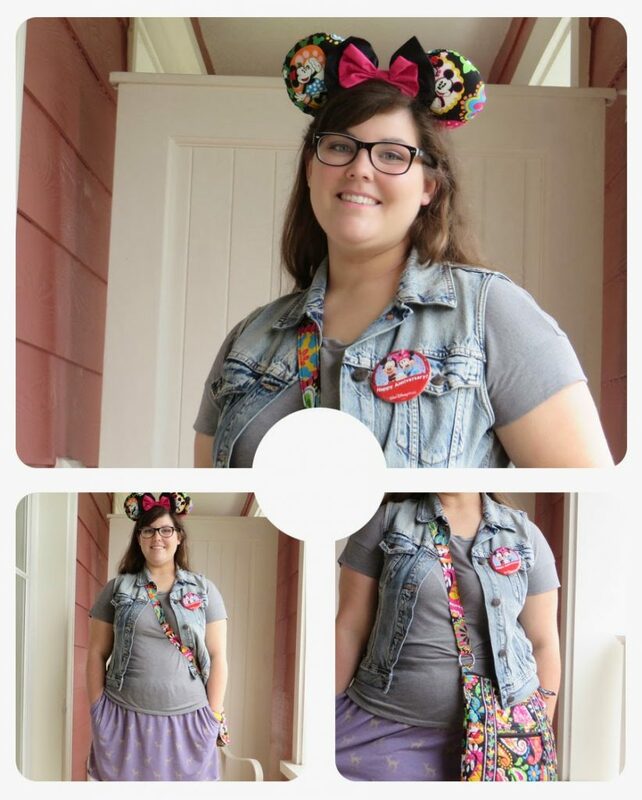 Check out my Disney inspired pocked tee here. What are some fun thing you like to do to make the days pass faster? Currently, I’m enjoying the beginning of our fifth anniversary Disney trip and because you’re probably going to get VERY tired of seeing it, I’m giving you a little break today. If you’re interested, you can follow along on Instagram by searching #afifthofhayes. Last week I was nominated by the adorable Aubrey and the marvelous Nicole (who is guest posting tomorrow) for a blog hop and a blog tour. I’m tagging the magnificent Katy to do either one next. 1. What am I working on? Always always the following week’s blog posts. There’s posts coming up about decorating an office space, fall capsule wardrobe remixes, and of course, some Disney to trail after my trip. 2. How does my work differ from those in my genera? My blog is different because I blog about a lot of things. My focus is decidedly life and style, but just like my interests in real life are varied, so does my life and style blog. 3. Why do I create/write what I do? Blogging has been one of those hobbies that I just can’t quit. It’s very cathartic for me. I enjoy creating and the more I learn about the ins and outs of blogging, like making pinterest images and how to creatively display my information, the more I love it. 4. How does your writing/creative process work? Do you remember making idea webs for brainstorming back in the first or second grade? That’s how. I use this blog content printable to help me organize my ideas and check off each step for posts. Make sure you follow the hop and see what Katy has to say!